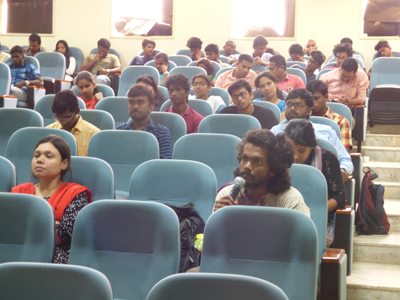 As a part of Sri Aurobindo Foundation for Indian Culture (SAFIC) collaboration with Pondicherry University, a special lecture series has been organized by the Department of Sociology. On February 28, 2019, Dr. Beloo Mehra, Senior Associate, SAFIC, was invited to speak on the topic – ‘Sri Aurobindo – A Pioneer Social Thinker’. 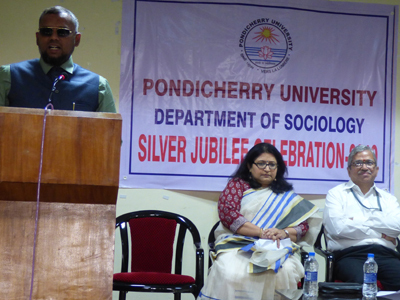 This lecture is also a part of the Silver Jubilee lecture series of the Department of Sociology. During her session, Dr. Mehra highlighted that the reason which makes Sri Aurobindo a pioneer in social or sociological thought is that he helps us gain an inner, deeply psychological view of how societies grow and evolve. Dr. Mehra also pointed out that the fundamental idea of Sri Aurobindo’s social thought builds upon one of the essential ideas of our ancient Indian wisdom, namely, the individual and society as two manifestations or expressions of the same Spirit. This, she added, has implication for the relationship between the individual and the society. Because of a fundamental identity of nature between the two, societal evolution can be understood by reflecting on an individual’s evolution. Brief information was also given about each of the stages discussed by Sri Aurobindo – symbolic, typal, conventional, individualistic and subjective to spiritual. Some examples relevant to the modern youth were taken up to illustrate a few points related to the psychological or inner meaning behind these evolutionary stages of a society. A few other examples were taken from the evolutionary march of Indian society and culture. An attempt was made to present this complex topic in as simple manner as possible. Dr. Mehra also elucidated that while these stages are somewhat progressive, we can see significantly visible aspects of the various phases simultaneously exerting their influence at any one point in time. This is especially true in a complex and highly diverse society such as India. Relevant examples were given to illustrate this point. Instances were also given as to how this complexity sometimes leads to intergenerational or intergroup conflicts. Moreover, Sri Aurobindo’s study is not limited to studying the phenomena of his times but as a visionary he told us about the future course of evolution, how societies will and must evolve in the light of that higher purpose and will of the Nature. 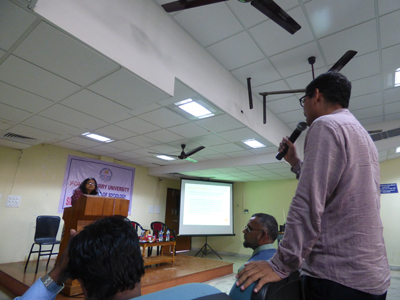 Some students and faculty asked a few relevant questions and clarifications at the end, which led to a fruitful discussion. 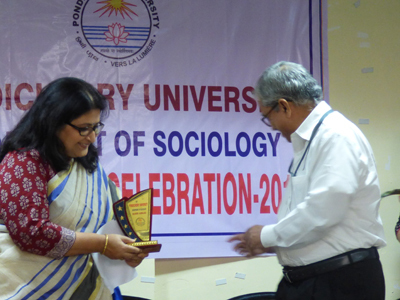 The Head of the Department of Sociology, while thanking the speaker Dr. Mehra, added that the Department will seriously explore the possibility of collaborating with SAFIC to create curricular content for Sri Aurobindo’s social thought for the university courses.